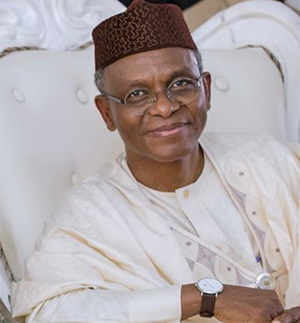 AHEAD the June 23 National Convention of the All Progressives Congress, APC, Governor El-Rufai of Kaduna State, Sunday commissioned the campaign headquater of the immediate past governor of Edo state, Comrade Adams Oshiomhole, declaring that “Oshiomhole is the next National Chairman of the APC”. Meantime, Comrade Oshiomhole said he will be chairman of all members of the party if elected, adding that he is not intimidated with the presence of other persons in the race which he said is good for democracy. Oshiomhole had last month declared his intention to run for the National Chairman of the APC after enjoying the endorsement of President Muhammadu Buhari, South South leadership of the APC and other major stakeholders in the party. Speaking after the commissioning, Oshiomhole who announced Hon.Farouk Aliyu as his Director General of his Campaign, said he believes that the current leadership of the party led by Chief John Odigie-Oyegun is doing its best to resolve the crisis rocking the party in some states. He said, “ For now the national leadership of the party under Chief John Odigie Oyegun is doing its best to resolve issues. Because like I keep saying to people you cannot have two chairmen at the same time. As we speak the party has a leadership and it is their challenge to try and sort out the problems that have arisen whether before, during or after the congresses. But for those of us who believe in democracy we are not worried about contestations. “Many people at various levels, including governors, senators and party leaders I am very hopeful they are in my support. I am working with everybody. My decision to contest for chairmanship if blessed by God, using our party leaders and members, entrust me with that responsibility is to be the chairman of everyone, not to be chairman of some and chairman of others. We want to have an all inclusive approach to leadership” he stated.